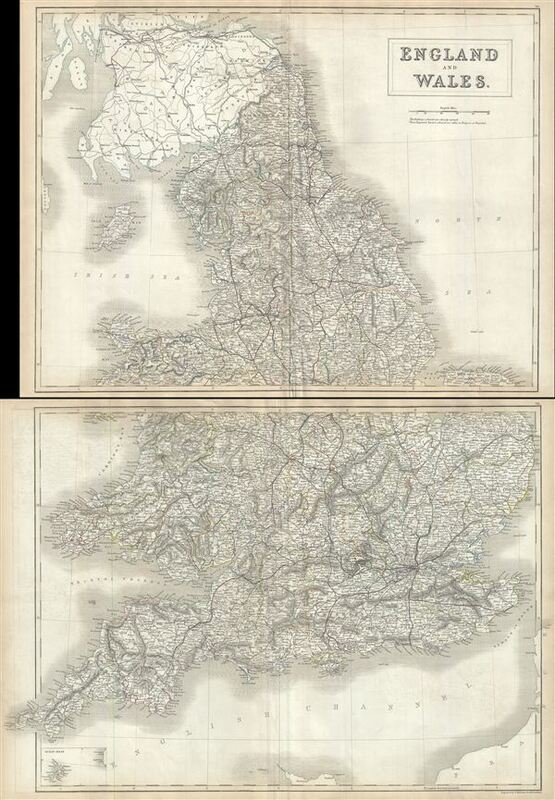 This is a fine 1844 map of England and Wales by Adam and Charles Black. The map, on two sheets, covers both England and Wales from Northumberland to Cornwall, including the Isle of Man and adjacent parts of Scotland. Small inset map on lower right quadrant of the map (on second sheet) details the Scilly Isles. Throughout, the map identifies various cities, towns, rivers, lakes, roadways and an assortment of additional topographical details. As this map was issued, both England and Wales were in the midst of the Industrial Revolution wherein much of the rural agricultural population relocated to urban centers. The map is engraved by S. Hall and issued as plate nos. VII and VIII in Black's General Atlas. Very good. Set of two maps. Original platemark visible. Blank on verso. Top margin of lower sheet exhibits minor loss. Some wear and creasing along original centerfold. Rumsey 2305.013, 2305.014, 2305.015 (1854 edition). Philips (atlases) 4334.